If you need to update your fall wardrobe with a new blazer, then you may choose that blazer to be a burgundy one. Burgundy is one of the colors that always take the stage during fall time and one way to wear it is to get one such blazer. And if you need some inspiration of how to wear a burgundy blazer, keep on reading because you are about to find some styling tips. Burgundy is a rich and deep shade that can go well with everything. It is definitely one of the must-wear colors for fall, since the fall season is all about wearing dark and bold shades. 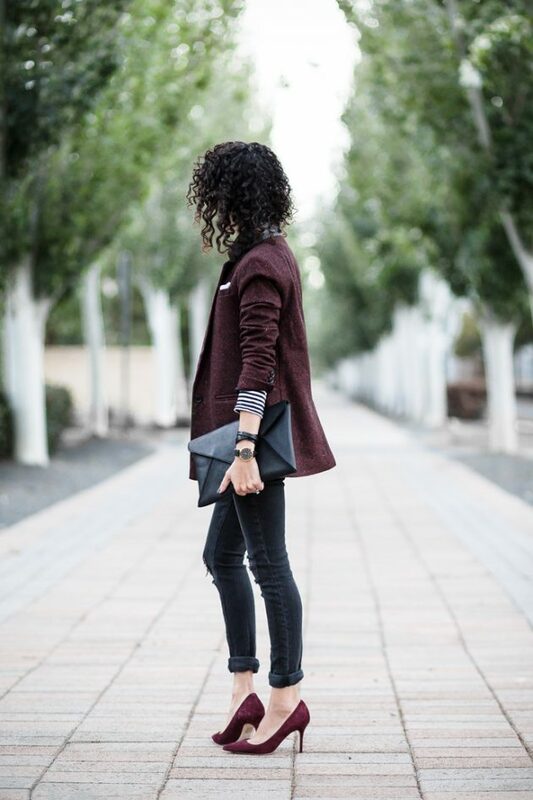 Burgundy looks best when combined with black, grey, white, navy and camel. Also the leopard print as well as denim work good with this color. 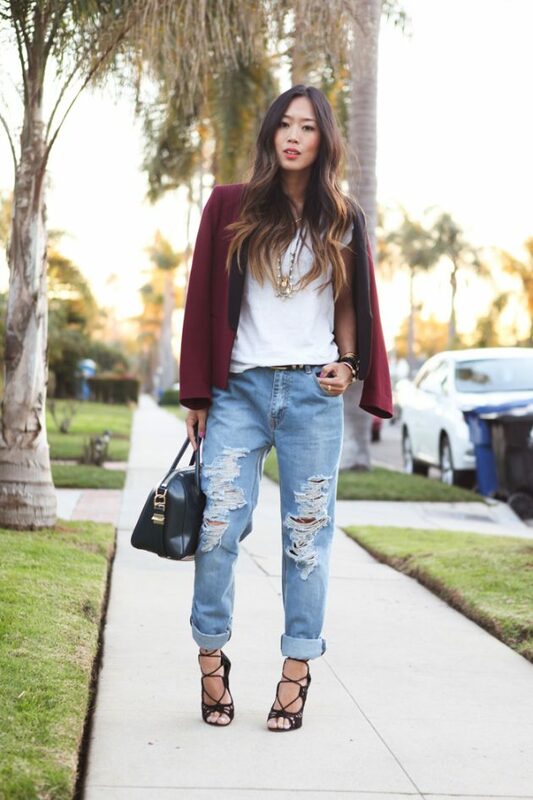 Here are several fall outfits with versatile burgundy blazers that you can try to copy. Enjoy! Depending on the style of the blazer, you can wear a burgundy blazer as part of your casual outfits, your office attire, or maybe even as part of your outfits for a night out. Combine it with the colors and patterns that we have mentioned above in order to wear it in the right stylish way. 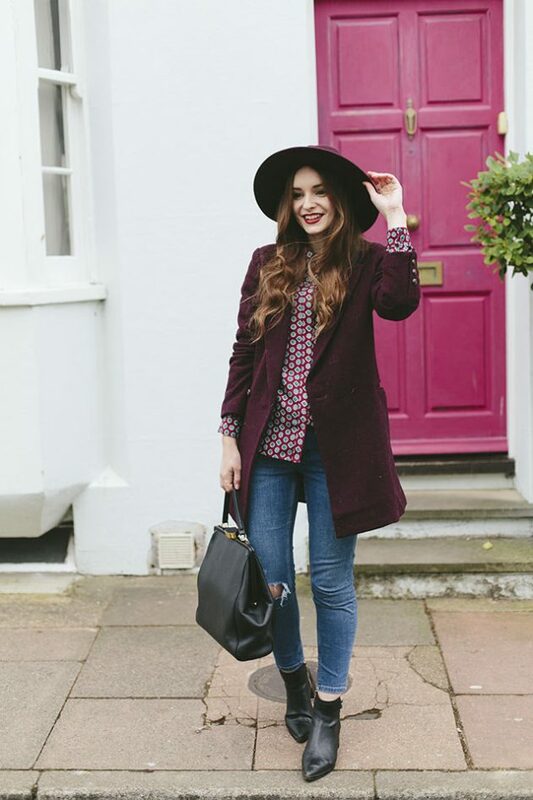 A burgundy blazer can be also part of your monochromatic outfits. For instance, if you decide to wear an all white outfit, put on some burgundy blazer to make it look less boring. You can do the same with an all black outfit. When it comes to the footwear color choice to wear with burgundy blazer, you can never be wrong if you match it with some burgundy heels or boots. Or if you think that’s too much burgundy on you, pair it with some black heels or bots. Also, blush and burgundy is another great combo that you can try to pull off, so how about you wear your burgundy blazer with a white top, jeans and blush heels. So, which one from the above fall outfits with burgundy blazer did you like the best? Tell us in the comments and do not hesitate to get some such blazer for the upcoming fall season. Thank you for reading and don’t forget to stay up to date with the content of Fashionsy to find many other outfit ideas for your style inspiration.